This unofficial "secret menu" sipper has been all the rage this summer. It's a Strawberry Acai Refreshers Beverage made with coconut milk instead of water, and it tastes just like a pink Starburst! There are a ton of other colorful off-menu variations now -- scope 'em out here. Wanna DIY for even fewer calories? 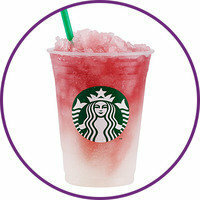 Whip up our Think Pink Drink at home! This is one of HG Lisa's go-to Starbucks orders -- she's pretty much obsessed with the bright red tea! And for a spin on the classic Arnold Palmer, order the Tea Lemonade version of this drink -- only 35 calories for the Tall unsweetened one, and the lemonade gives it plenty of sweetness! This is a classic espresso drink, made by adding hot water to espresso for a drink that sips like a really good cup of coffee. 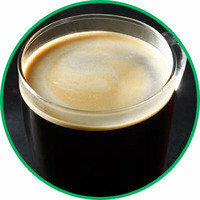 If you like the taste of espresso but not the concentrated strength, this is the beverage for you. Just don't ruin the low calorie count by adding loads of sugar and half & half... Stick with no-cal sweetener (or just a small amount of sugar) and a splash of fat-free milk, soymilk, or coconut milk. Cold brew is hot right now, and this schmancy variation is seriously special. 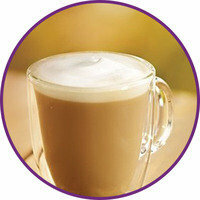 The coffee is slow-steeped for over 20 hours, and finished off with a bit of vanilla sweet cream... YUM! If you want a version that's even lower in calories, stick with the plain Cold Brew (0 calories), and add no-calorie sweetener and a splash of your go-to light milk. If you're at the 'Bucks late in the day, check out the Sunset Menu, served daily after 3pm. Some of the options are a bit too indulgent, but not this one! The tea itself is "white tea with red currants, acai berry, hibiscus and rose petals, then completed with candied pineapple, mango pieces, Fuji and golden delicious apples." WOW. Served over lemonade-flavored shaved ice, it's just the thing to beat that July heat. OK, we just love saying this one -- it's Fizzy, Yo! (Sorry. Couldn't help that.) Anyhow, this house-made soda has fewer calories than standard pop, and it's made with real ginger, citrus, and brown sugar. If you're just looking for something sweet and bubbly to sip, skip the standard fountain drinks, because this is a total upgrade. 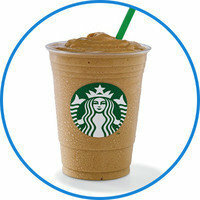 Yup, you can have a creamy frozen Frap for under 100 calories! If you're trying to kick a milkshake craving and a get a coffee fix at the same time, this is your drink. Need an extra boost of caffeine? Order it Affogato style, with a shot of espresso on top! 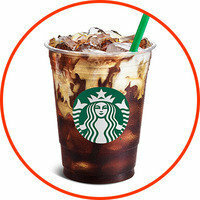 Here's another alternative to plain old iced coffee -- chilled espresso, over ice, with a touch of milk and syrup. 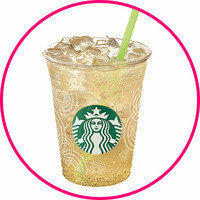 To slash the calorie count down to 20 and reduce the sugar to 2g, just order it unsweetened. Then add a little no-calorie sweetener to taste! Last but not least, the original light Starbucks drink. Yeah, it's not much in the way of summer refreshment, but sometimes you just need a latte! Use your one-word shortcut (Skinny!) to a nonfat latte made with sugar-free syrup, and enjoy your lightened-up latte. Happy National Baked Bean Month, a.k.a. July. Make our classic Slow-Cooker Fake-Baked Beans recipe ASAP -- so good! Got pals with a Starbucks habit? Click "Send to a Friend" before they make their next run!